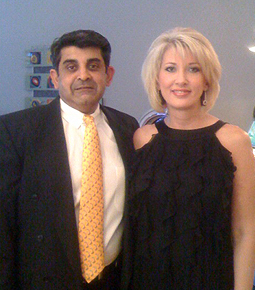 Dr. Minesh Y. Patel graduated from the University Of Tennessee College of Dentistry in Memphis in 1992. He served two years in the United States military in the Public Health Service where he was a staff dentist for the Federal Bureau of Prisons–responsible for 1250 inmates. He then worked for two years in a private practice before coming to Family & Cosmetic Dentistry of Jackson 17 years ago. In June of 2011, he became the full owner of the practice along with Family & Cosmetic Dentistry of Memphis. He has been married to his wife, Misty Patel, for the past 13 years. She is actively involved in both offices. Throughout his career, he has worked as a part-time instructor in the Dental Assisting Program for the American Dental Association teaching various subjects as: Anatomy & Physiology, Microbiology, Oral Anatomy and Oral Pathology. He also worked as a part-time instructor in the Dental Assisting Program for the Basic Dental Association teaching basic science courses and clinical labs. Dr. Minesh Y. Patel is involved in the following professional organizations: American Dental Association, Academy of General Dentistry and Tennessee Dental Association.